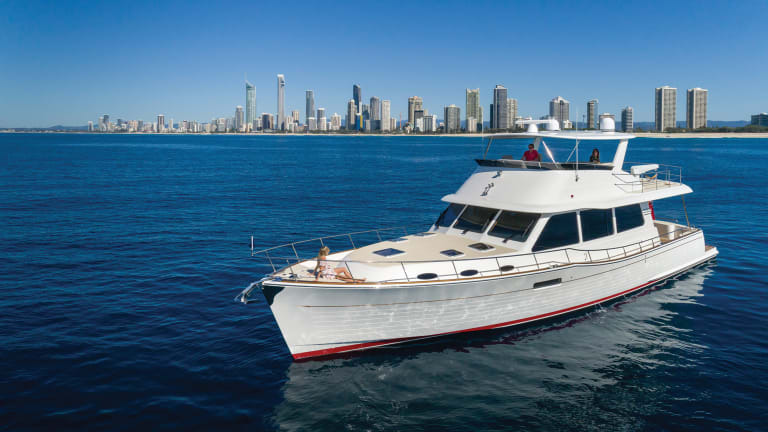 The 60 is a true, long-range cruising boat, but she also has enough oomph to reach 30 knots. 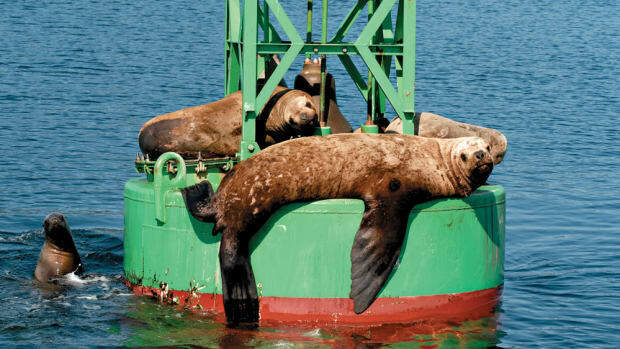 Rick-O, I presumed, was Mark Richards, the builder of Anura 2, Berkman’s brand-new Grand Banks 60, the first one to splash since the reorganization of Grand Banks under Richards. 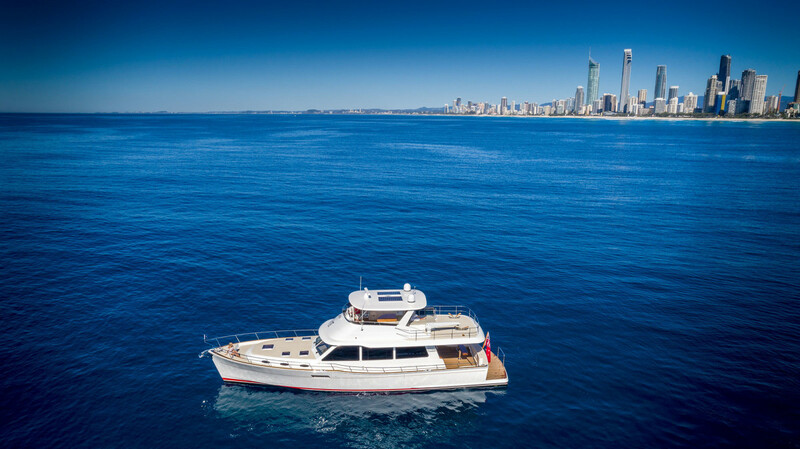 I also figured that what Berkman was happy about and impressed with was the way his new boat had performed during her maiden voyage from Queensland’s Gold Coast some 400 nautical miles south to the big city of Sydney. He’d enthusiastically talked about taking his boat home several times while we’d sea trialed her on Gold Coast’s Broadwater Estuary. I continued to read, noting that the rest of the email—what Berkman had initially sent to Richards—provided oodles of feedback specifics on the 60’s long-range traits and capabilities. But beyond the data points, boat-handling details, and references to sea state, I also noted two exceptionally descriptive passages that captured the very essence of the new Grand Banks, thereby showcasing not only her true mission in life but the solid, salty ways she fulfills it. A practically laid out helm as a smaller-than-traditional Grand Banks wheel. “After reaching open waters,” the first passage began, “we encountered a messy, moderate head sea. However, the hull just refused to pound or slam despite our steady 20 knots over the short three-foot swell and chop. Then, gradually, as we cleared Gold Coast and turned south, conditions improved and we settled into running at 1,560 rpm at around 19.5 knots at 116 liters (30.6 U.S. gallons) per hour. “But the biggest win for me was the serenity at this cruise speed. We measured 62 dBA which is whisper quiet, especially compared to my previous boat, which ran at 79 dBA at 16 knots. This sort of thing points up the fact that there’s a great deal of difference between enjoying your passagemaking and arriving frazzled and with ringing ears. 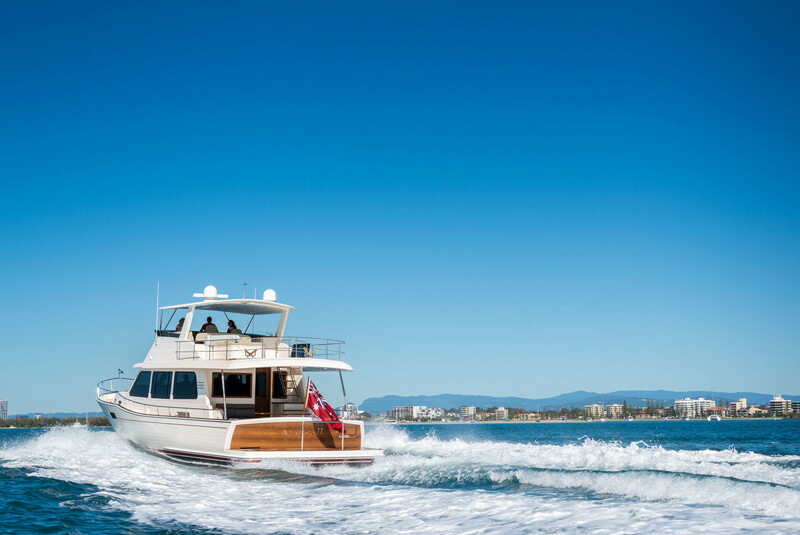 The new Grand Banks 60 is still a classic long range cruiser that now has the ability to pick up and go 30 knots. As I read the last sentence, I hesitated briefly over the part about the great night’s sleep, remembering a few of the wonderful passagemaking nights I’ve enjoyed myself over the years, sleeping dreamlessly in air-conditioned comfort, with a reassuring diesel rumble off in the distance and a trusted comrade on watch. Although such memories certainly harmonized with the 60’s sum and substance, I knew from experience that the boat’s capabilities went well beyond the steadfast crossing of oceans, a state of affairs that perhaps, in some way, prepared me for the hyperbolic nature of the second and final passage. David Berkman, owner of the 1st Grand Banks 60&apos; jokes that the thought of barefoot waterskiing crossed his mind when they first opened up the throttles. The 60’s decidedly un-trawler-esque behavior comes from her relatively light displacement, low vertical center of gravity (VCG), and precisely balanced longitudinal center of gravity (LCG). Her warped bottom is virtually smooth, except for a modest set of chine flats and a short skeg. It doesn’t have any running strakes, tunnels, or steps and doesn’t need them to generate lift and dynamic stability. 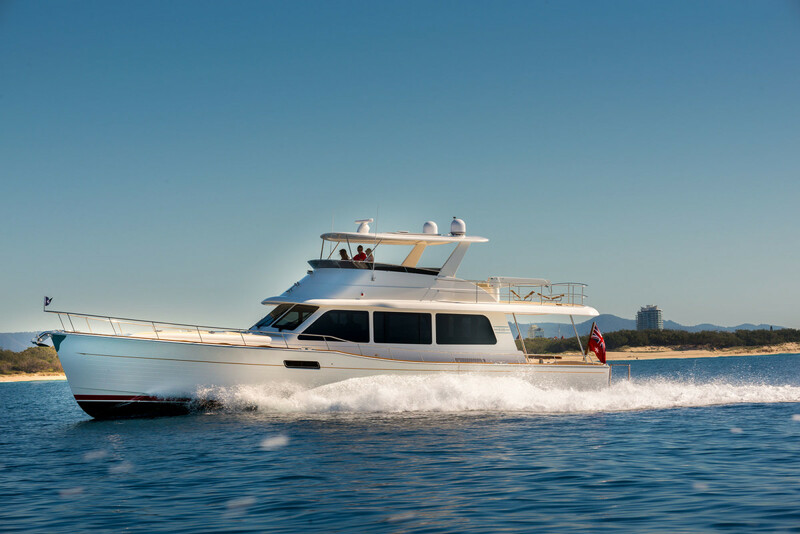 The boat’s hull is comparatively heavy, thanks to a conventional layup of hand-laid E-glass and vinylester resin, but her deck, superstructure, and hardtop are molded from lightweight, wholly-infused, Gurit Corecell-cored carbon-fiber laminates. 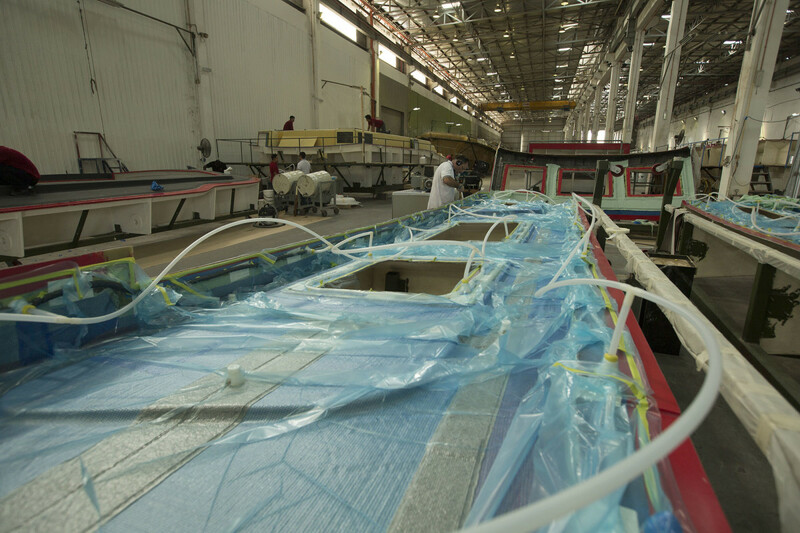 The hull of the new Grand Banks 60 is made of a conventional layup of vacuum bagged E-glass and vinylester resin, her super structure however are incredibly light in comparison, keeping the weight of the whole vessel down as they are built from infused carbon fiber laminates. In making what’s below the 60’s rubrail hefty and what’s above much less so, the company has combined the effects of a very low VCG (which tends to boost transverse stability and reduce skin-friction-related drag, especially in turns) with the serious reduction in displacement that carbon fiber brings. 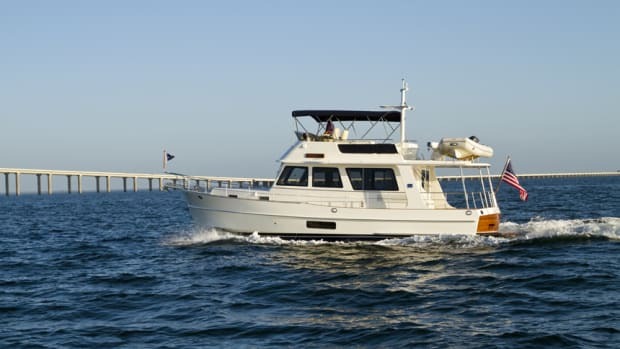 The Grand Banks 60&apos; is a very well balanced boat. Balance is another performance promoter. During my sea trial I recorded a maximum running angle of just 2.5 degrees, an attitude she achieved at 1,000 rpm (11 knots) and steadily maintained over the remainder of the rpm register. Her balanced LCG makes for solid, even exceptional, efficiency and virtually no—or at least very little—obfuscating, drag-producing, bow rise. Indeed, the 60 doesn’t so much come “out of the hole” when achieving plane as rise bodily from her element, without lifting her nose appreciably. And finally, as if to confirm Berkman’s proud references in the email to Richards, I recorded sound levels on board the 60 during our sea trial that were singularly whispery, thanks to a variety of savvy engineering strategies, which include fire-retardant and vibration-attenuating products from Pyrotek in the engine room (including Dedidamp tiles in way of the props and elsewhere); the vibration-nixing structural bonding of bulkheads and furniture to both hull and deck; and the noise-blocking presence of a single, massive amidships fuel tank that separates the machinery spaces from the accommodation spaces farther forward. Indeed, we had to throttle up to 18 knots before sound levels went beyond 65 decibels, the level of normal conversation, in the master, VIP, and guest staterooms. Of course, when you get right down to it, the oceangoing side of the 60’s personality, which Berkman so poetically described in his email, is darn near as impressive as her top speed. 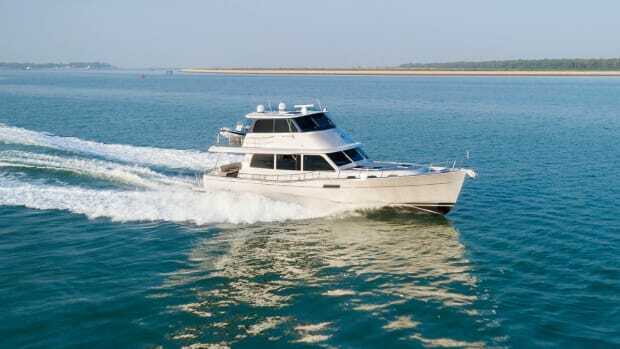 Throttle her two 900-horsepower Volvo Penta D13-900 diesel inboards down to just 750 revs for a smooth-water cruising speed of 9.5 knots—not bad for an ocean passage in my opinion—and you’ve got yourself a range of roughly 2,973 nautical miles, factoring in a 10 percent reserve. That’s more than enough to travel, say, from Halifax, Nova Scotia, to Plymouth, England, weather permitting. Not bad for your typical passagemaker, eh? But for a 30-knot boat? 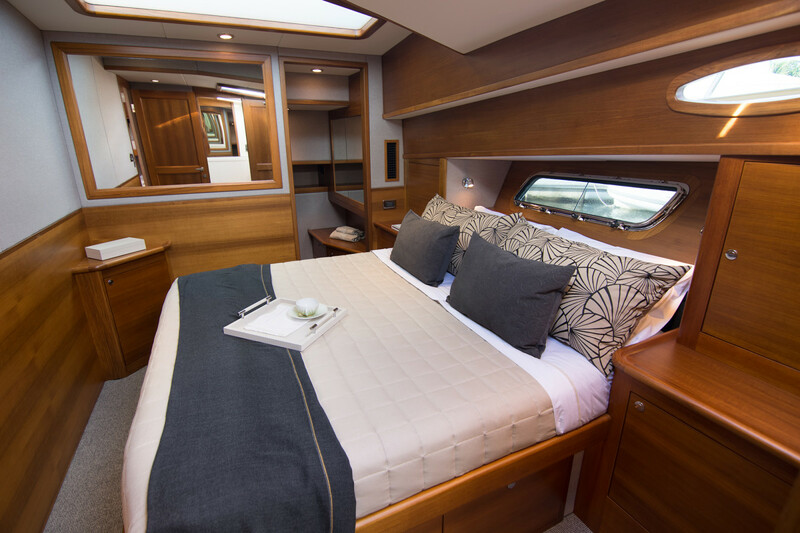 The Grand Banks 60&apos; features spacious and comfortable accommodations. And the journey would likely be a comfortable one. 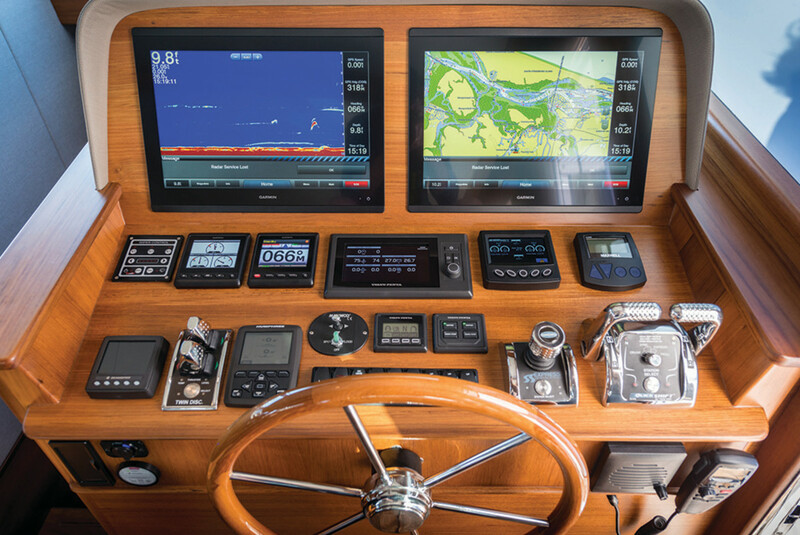 Consider, for a moment, the kick-back factor inherent in our test boat’s expansive, time-tested, cruise-worthy layout. 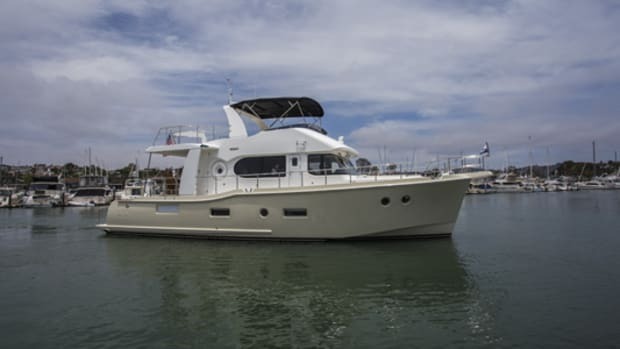 It offered a broad, bright, inviting saloon on the main deck, with wraparound windows (some electrically retracting), an optional galley aft (with a big, flip-up window for ventilation and cockpit interactivity), a simple, easy-to-understand-and-use helm forward, and a large dinette with opposed settee in between. The bottom deck was equally cushy—instead of a raft of cramped and potentially unusable staterooms, there were just three sizable ones, an en suite master aft, a VIP (with adjoining head, island berth, and a couple of optional Pullman-type bunks), and a guest twin. 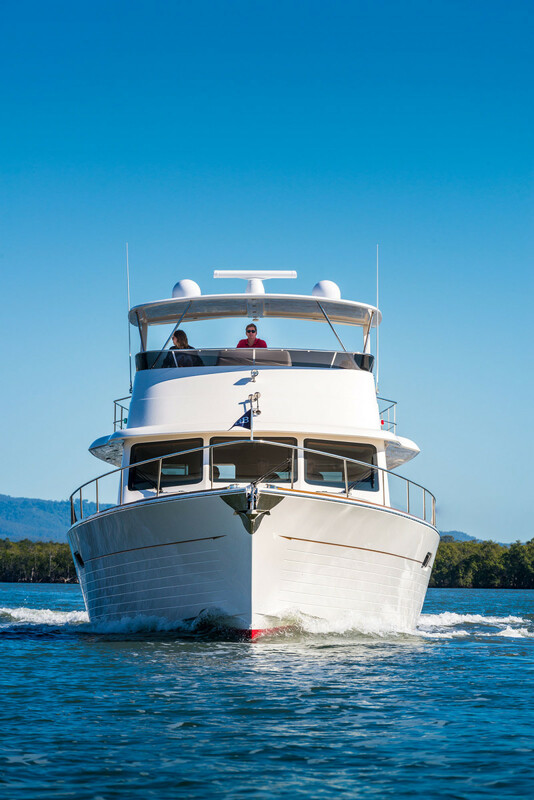 While the new Grand Banks 60&apos; has a contemporary design, her Burmese teak joinery is on par with classic Grand Banks interiors and workmanship. And style? 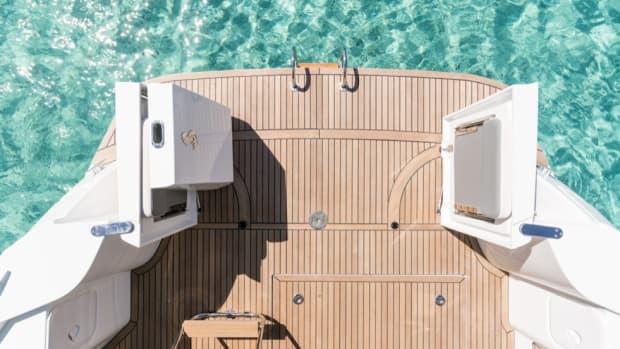 The Burmese teak joinery throughout our 60 was sweetly crafted and reminiscent of the precisely detailed Grand Banks trawlers of old. 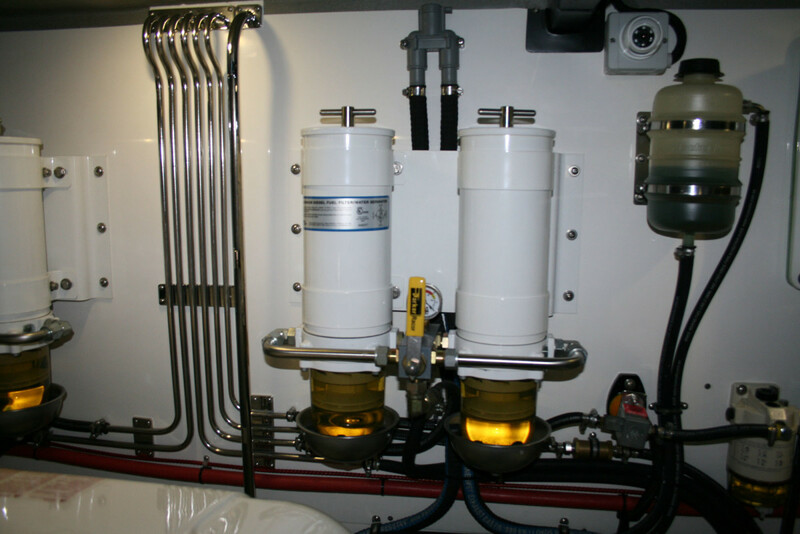 Outfitting was high end too, with top brands like Miele, Franke, Silestone, and Sharp in the galley and memory-foam mattresses in the berthing areas. 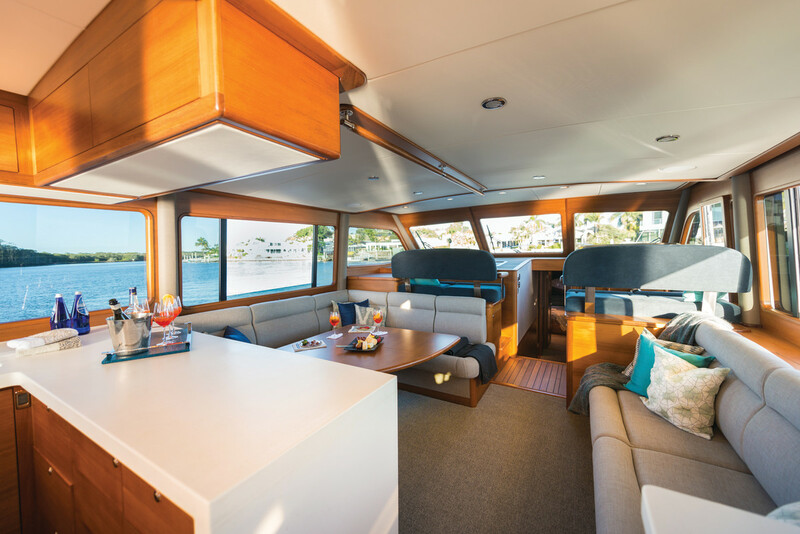 The Cruisair air-conditioning system kept things tastefully cool via a series of supply and return plenums that were cleverly blended into the decor. In the saloon, for example, a “false ceiling” concealed supply plenums on the sides and a return plenum on the leading edge. And the teak-covered transom that’s figured into the cachet of the Grand Banks marque for years and years—on our test boat it consisted of teak veneer (with solid-teak edges) secured in an infused carbon-fiber tray with the boat’s name overlaid in precisely cut, polished stainless-steel letters. The letters, by the way, were affixed with 3M 5200 and slightly raised so that they can be removed via a careful sawing motion with monofilament line. Practical? Yup. I’d be remiss if I didn’t convey at this point the depth of the engineering technology that Berkman’s boat displayed, a subject that’s perhaps best illustrated by a visit to her engine room. I paid mine on the morning of our sea trial by simply lifting a shock-actuated, teak-paved hatch in the cockpit, going down a short ladder into the lazarette (where the machinery for the Hypromarine electric-over-hydraulic steering system resides), and then operating the dogs of a watertight door. I was a tad surprised at first—the engine room had only 5’ 3” of headroom. But the fact that the central Lonseal-clad walkway between the D-13s was a full 5’ wide, surpassing anything I’ve seen before in the 60’s size range, helped me regain my composure. The elbowroom outboard of the main engines stretched at least three feet or more to the hullsides, which helped even more. Limited headroom in the 60’s engine room, I suppose, is a small price to pay for a low, sleek profile, which imparts a modern touch to the faux-planked topsides and angular superstructural shapes that have trademarked Grand Banks since Ol’ Tige was a pup. The engine room sports simplicity and is organized for efficiency. Seagoing simplicity was the obvious priority. It took only moments for me to identify and locate virtually all major components beyond the engines and Fisher-Panda genset—the reservoirs for the SeaTorque enclosed-shaft system; the lithium-ion house and AGM-type engine-start batteries (with smaller batts doubled up to do service for larger, heavier, more unwieldy versions); the electrics for the two standard Enerdrive solar panels on the hardtop’s roof (which keep onboard refrigeration operable without assist from either genset or shorepower); the complexities associated with the optional, three-station Twin Disk EJS system; the Groco safety seacocks (in lieu of crash pumps); and the demister-equipped ventilation boxes that passively supply fresh cool air for the mains via natural convective action. 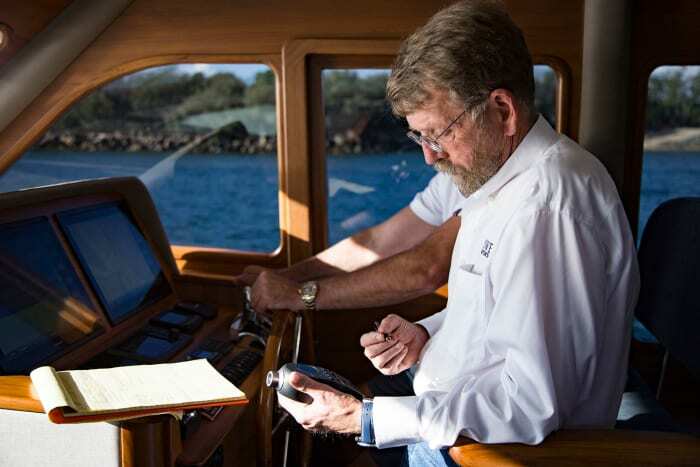 As Berkman and I finished up the sea trial of his boat together that afternoon in Australia, he became uncharacteristically quiet when I asked him to take a minute and explain what owning such a fast, seaworthy, and capable vessel means to him. He remained quiet for some time, seemingly overcome with emotion. Then, finally, he collected himself, saying he’d try to address the matter later, once he’d managed to fully understand and assimilate his great fortune. As promised, an email arrived just a day or so before the one I’ve already excerpted. The new Grand Banks 60 in Sydney Harbor. Capt. Pike testing the sound levels and running speeds of the new Grand Banks 60.